So basically I removed his whole front and carved and whittled the torso so I could build things on it. I removed some skulls as 5 was too many. It came out pretty nice. I like the Hat. A very manageable size, nothing enormous. A good throwback. A Sorcerer could have easily been made by adding different armament. Spin spin! Haha, I've seen this done before and thought I would give it a shot. 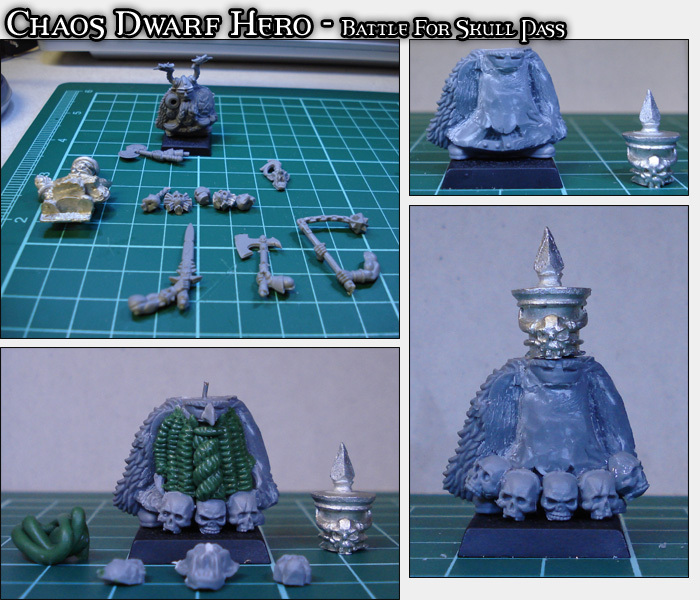 Wow thats awsome can't wait to see it painted.P.S I would segest some straps attached to the skulls. Very nice. Where is everyone getting these plastic noses from? The noses are from goblin heads. Yes, either straps, or make it more apparent that the skulls are attached to the beard, which is what I think you're going for. Fantastic conversion I must say. Props Xander! Yet again a 5* performance from Xander. it looks great so far. Will it be getting a shield? the left arm looks sheild posed. 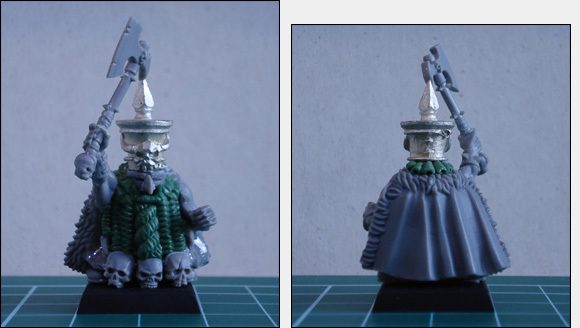 Well if you look in the first pic were nothing was converted you will see a goblins head. I was looking for a way t use this model, you have inspired me once again sir! Nice work Xander, I twisted beard is very cool. Just one criticism, the position of his right arm looks a bit off to me, it might just be the pics though. what model did you get the hat from? so, when are you going to paint him? This post was last modified: 09-12-2007 06:31 AM by Hammerhand.